Collecting critical event documents has never been easier. Certificates of Insurance, Signed Contracts & Riders, Compliance Docs, Waivers & more. Request any type of document you need from your vendors, artists & sponsors. The process to collect, track, and review critical documents from your vendors, artists, sponsors and any third party group is time consuming, tedious and often ineffective. Just look at the process. Your vendors submit their documents via email, you store them in a shared drive somewhere, and you track the status for each of your groups in some spreadsheet you’ve created. This fragmented, costly process can easily compound with every document and vendor you add. 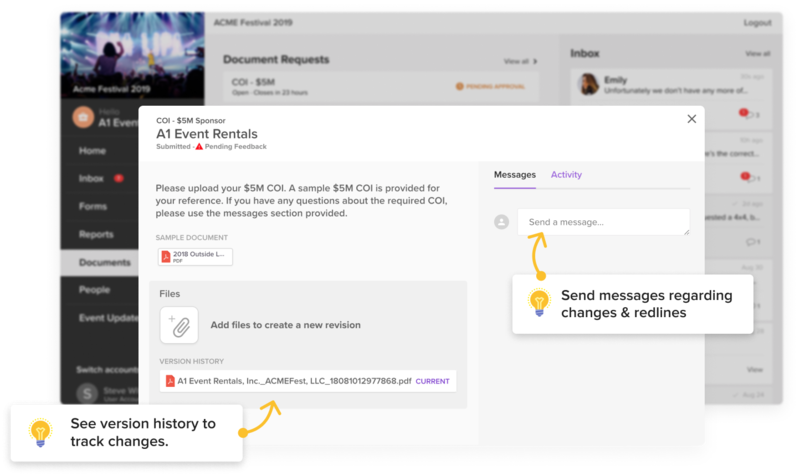 With Lennd, you get a centralized place to collect critical event documents & files from all of your vendors, artists participating groups. You get one place to track the status of the assigned doc requests - and your groups get one place to see all the things they are required to submit via the Lennd event portal. 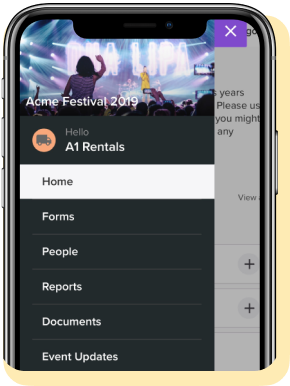 With all of the requests, due dates and key information a vendor needs to provide when working an event, many forget what, where and when to submit their required documents. With Lennd you can give them one simple place to submit and check the status of their critical documents. 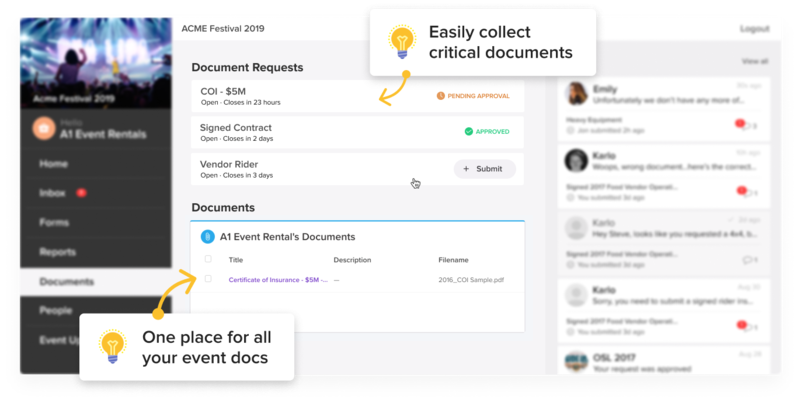 See how top event teams are saving time collecting required documents from their event vendors & groups. Communicating changes on documents and tracking the most up to date versions is one of the problems that slows the process down so much. With Lennd, you & your vendors have a centralized place to track all of this. Managing and tracking who has and has not submitted, what’s in review, pending changes, and what’s been approved is a time consuming task. Going back and forth between email chains and tracking status in an excel file or google sheets makes the process inefficient and slow. With Lennd, all of this is tracked for you in realtime. You have a quick view of which documents you need to review and which groups you need to reach out to with changes. Now you can stay on top of the whole process without doing the tedious work. 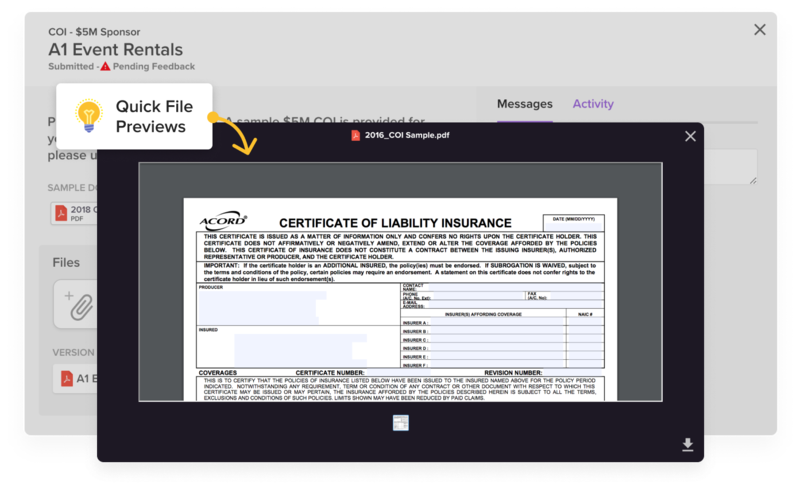 When reviewing a submitted document in Lennd, you now have a dedicated place to view revision history, a log of communication and changes, the ability to quickly preview the document and a simple way to mark it as approved. All in one place. The Best Part? It's Easy to Setup. Communicating what documents to submit, any group specific requirements, AND getting them all submitted on time is a near impossible task for most events. 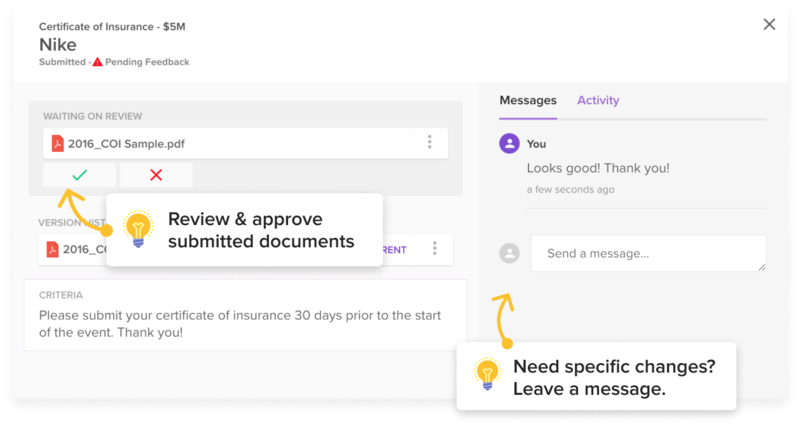 With Lennd, you can spin up a new document request, specify the criteria & requirements, and assign it to the relevant groups in a matter of seconds. Benefits of Collecting Documents with Lennd. Collect documents on time & more efficiently.